If you are morphing two sequences in a row, you will have to create a different set of hint points for each sequence. Morphing two sequences in a row requires three drawings: 1, 2 and 3. 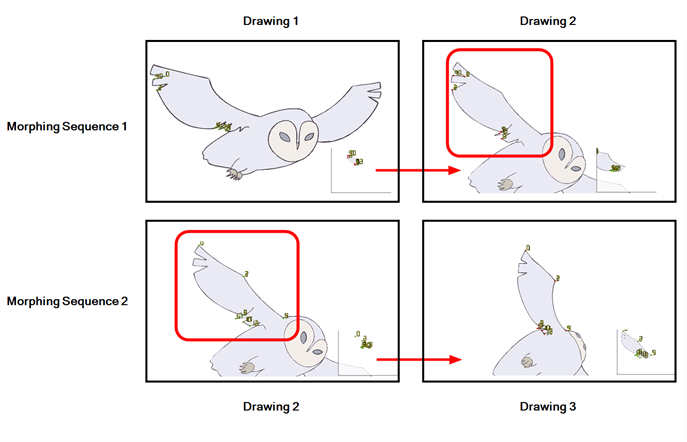 Using these three drawings you create two morphing sequences; one sequence between drawings 1 and 2, and a second sequence between drawings 2 and 3. Each morphing sequence has its own set of parameters and hints. This means that Drawing 2 will have a set of hints for the first sequence and another set for the second sequence. The two sets of hints will not show at the same time. Each set of hints that appears always corresponds to the morphing sequence you are working on.